We are now entering the fourth industrial revolution. Industry 4.0 is changing how we interact with machines and how these machines interact with each other. This will have a significant impact on the warehouse. With decentralized, networked intelligence, advanced robotics and self-organized processes, the warehouse of the future will take a giant step forward in productivity, flexibility and efficiency. Backed by KUKA, Swisslog is ready to lead you on the journey to achieving the highest intralogistics performance in a digital age. Dr. Christian Baur, CEO Swisslog Logistics Automation, at HMI Hannover Messe 2018 presents the Swisslog & KUKA Future Ready Logistics Automation Solution. You can see the automation powerhouse including accurate gripping robotics, SynQ Software and our Big Data solution with self-learning algorithms. Movie: Dr. Christian Baur at HMI Hannover Messe 2018. The future of warehouse management and distribution centers requires maximum flexibility, full automation, and smart data. 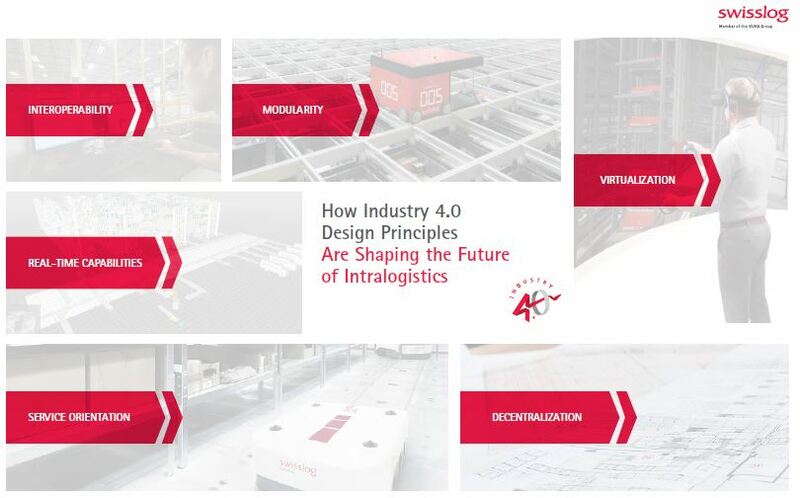 Intralogistics is evolving from large, rigid systems into modular, flexible software-driven solutions that are robot-supported and self-optimizing. Decades of experience have made Swisslog the technological pioneer in a new era of flexible and data-driven solutions. We have unique Industry 4.0 technological expertise and have developed skilled inhouse software competence. HoloLens technology to design optimum case pick solutions and train operators. We continuously strive to improve our products and innovate in–line with market and region demands. We proactively engage with customers in our focus industries. Our SynQ software is a cornerstone in Swisslog’s strategy and vision towards digitalization and Industry 4.0. Swisslog's Industry 4.0 solutions are based on our SynQ warehouse management software, which gives you the flexibility to focus on improving and growing your business. We take care of your logistics while you remain focused on your core competences and your customers. Rigid logistics is a thing of the past. We are ready for the journey into the future and will start it together with our customers. KUKA is a trailblazer for Industry 4.0. Find out how it is playing a decisive role in the shift toward networked, intelligent production. Industry 4.0 fully automated Condition Monitoring at Roche’s logistics facility immediately detects errors, ensuring they can be addressed rapidly.